6, originally called hexuronic acid. It is a white solid, but impure samples can appear yellowish. It dissolves well in water to give mildly acidic solutions. It is a mild reducing agent. Ascorbic acid exists as two enantiomers (mirror-image isomers), commonly denoted "L" (for "levo") and "D" (for "dextro"). The L isomer is the one most often ecountered: it occurs naturally in many foods, and is one form ("vitamer") of vitamin C, an essential nutrient for humans and many animals. Deficiency of vitamin C causes scurvy, formerly a major disease of sailors in long sea voyages. It is used in as a food additive and a dietary supplement for its antioxidant properties. The "D" form can be made via chemical synthesis but has no significant biological role. The antiscorbutic properties of certain foods were demonstrated in the 18th century by James Lind. In 1907, Axel Holst and Theodor Frølich discovered that the antiscorbutic factor was a water-soluble chemical substance, distinct from the one that prevented beriberi. Between 1928 and 1932, Albert Szent-Györgyi isolated a candidate for this substance, which he called it "hexuronic acid", first from plants and later from animal adrenal glands. In 1932 Charles Glen King confirmed that it was indeed the antiscorbutic factor. In 1933, sugar chemist Walter Norman Haworth, working with samples of "hexuronic acid" that Szent-Györgyi had isolated from paprika and sent him in the previous year, deduced the correct structure and optical-isomeric nature of the compound, and in 1934 reported its first synthesis. In reference to the compound's antiscorbutic properties, Haworth and Szent-Györgyi proposed to rename it "a-scorbic acid" for the compound, and later specifically L-ascorbic acid. Because of their work, in 1937 the Nobel Prizes for chemistry and medicine were awarded to Haworth and Szent-Györgyi, respectively. For this reason, ascorbic acid is much more acidic than would be expected if the compound contained only isolated hydroxyl groups. The ascorbate anion forms salts, such as sodium ascorbate, calcium ascorbate, and potassium ascorbate. Ascorbic acid can also react with organic acids as an alcohol forming esters such as ascorbyl palmitate and ascorbyl stearate. The ascorbate ion is the predominant species at typical biological pH values. It is a mild reducing agent and antioxidant. It is oxidized with loss of one electron to form a radical cation and then with loss of a second electron to form dehydroascorbic acid. It typically reacts with oxidants of the reactive oxygen species, such as the hydroxyl radical. On exposure to oxygen, ascorbic acid will undergo further oxidative decomposition to various products including diketogulonic acid, xylonic acid, threonic acid and oxalic acid. Reactive oxygen species are damaging to animals and plants at the molecular level due to their possible interaction with nucleic acids, proteins, and lipids. Sometimes these radicals initiate chain reactions. Ascorbate can terminate these chain radical reactions by electron transfer. The oxidized forms of ascorbate are relatively unreactive and do not cause cellular damage. However, being a good electron donor, excess ascorbate in the presence of free metal ions can not only promote but also initiate free radical reactions, thus making it a potentially dangerous pro-oxidative compound in certain metabolic contexts. It creates volatile compounds when mixed with glucose and amino acids in 90 °C. It is a cofactor in tyrosine oxidation. Another major use of L-ascorbic acid is as dietary supplement. In fluorescence microscopy and related fluorescence-based techniques, ascorbic acid can be used as an antioxidant to increase fluorescent signal and chemically retard dye photobleaching. It is also commonly used to remove dissolved metal stains, such as iron, from fiberglass swimming pool surfaces. In plastic manufacturing, ascorbic acid can be used to assemble molecular chains more quickly and with less waste than traditional synthesis methods. Heroin users are known to use ascorbic acid as a means to convert heroin base to a water-soluble salt so that it can be injected. As justified by its reaction with iodine, it is used to negate the effects of iodine tablets in water purification. It reacts with the sterilized water, removing the taste, color, and smell of the iodine. This is why it is often sold as a second set of tablets in most sporting goods stores as Portable Aqua-Neutralizing Tablets, along with the potassium iodide tablets. Intravenous high-dose ascorbate is being used as a chemotherapeutic and biological response modifying agent. Currently it is still under clinical trials. Natural biosynthesis of vitamin C occurs in many plants, and animals, by a variety of processes. The outdated, but historically important industrial synthesis of ascorbic acid from glucose via the Reichstein process. Eighty percent of the world's supply of ascorbic acid is produced in China. Ascorbic acid is prepared in industry from glucose in a method based on the historical Reichstein process. In the first of a five-step process, glucose is catalytically hydrogenated to sorbitol, which is then oxidized by the microorganism Acetobacter suboxydans to sorbose. Only one of the six hydroxy groups is oxidized by this enzymatic reaction. From this point, two routes are available. 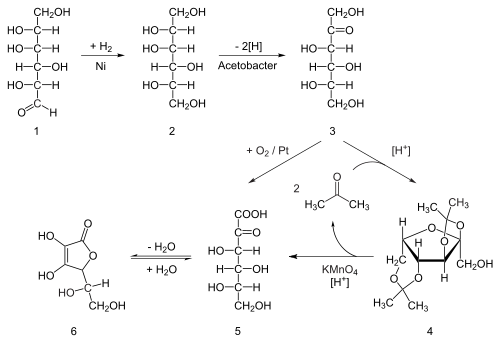 Treatment of the product with acetone in the presence of an acid catalyst converts four of the remaining hydroxyl groups to acetals. The unprotected hydroxyl group is oxidized to the carboxylic acid by reaction with the catalytic oxidant TEMPO (regenerated by sodium hypochlorite — bleaching solution). Historically, industrial preparation via the Reichstein process used potassium permanganate as the bleaching solution. Acid-catalyzed hydrolysis of this product performs the dual function of removing the two acetal groups and ring-closing lactonization. This step yields ascorbic acid. Each of the five steps has a yield larger than 90%. A more biotechnological process, first developed in China in the 1960s, but further developed in the 1990s, bypasses the use of acetone-protecting groups. A second genetically modified microbe species, such as mutant Erwinia, among others, oxidises sorbose into 2-ketogluconic acid (2-KGA), which can then undergo ring-closing lactonization via dehydration. This method is used in the predominant process used by the ascorbic acid industry in China, which supplies 80% of world's ascorbic acid. American and Chinese researchers are competing to engineer a mutant that can carry out a one-pot fermentation directly from glucose to 2-KGA, bypassing both the need for a second fermentation and the need to reduce glucose to sorbitol. The traditional way to analyze the ascorbic acid content is the process of titration with an oxidizing agent, and several procedures have been developed. The popular iodometry approach uses iodine in the presence of a starch indicator. Iodine is reduced by ascorbic acid, and, when all the ascorbic acid has reacted, the iodine is then in excess, forming a blue-black complex with the starch indicator. This indicates the end-point of the titration. As an alternative, ascorbic acid can be treated with iodine in excess, followed by back titration with sodium thiosulfate using starch as an indicator. This iodometric method has been revised to exploit reaction of ascorbic acid with iodate and iodide in acid solution. Electrolyzing the solution of potassium iodide produces iodine, which reacts with ascorbic acid. The end of process is determined by potentiometric titration in a manner similar to Karl Fischer titration. The amount of ascorbic acid can be calculated by Faraday's law. Another alternative uses N-bromosuccinimide (NBS) as the oxidizing agent, in the presence of potassium iodide and starch. The NBS first oxidizes the ascorbic acid; when the latter is exhausted, the NBS liberates the iodine from the potassium iodide, which then forms the blue-black complex with starch. Erythorbic acid: a diastereomer of ascorbic acid. ^ Story of Vitamin C's chemical discovery. Profiles.nlm.nih.gov. Retrieved on 2012-12-04. ^ Davies, Michael B.; Austin, John; Partridge, David A. (1991). Vitamin C: Its Chemistry and Biochemistry. The Royal Society of Chemistry. p. 48. ISBN 0-85186-333-7. ^ Seck, S.; Crouzet, J. (1981). "Formation of Volatile Compounds in Sugar-Phenylalanine and Ascorbic Acid-Phenylalanine Model Systems during Heat Treatment". Journal of Food Science. 46 (3): 790–793. doi:10.1111/j.1365-2621.1981.tb15349.x. ^ Sealock, R. R.; Goodland, R. L.; Sumerwell, W. N.; Brierly, J. M. (1952). "The Role of Ascorbic Acid in the Oxidation of l-Tyrosine by Guinea Pig Liver Extracts" (PDF). Journal of Biological Chemistry. 196 (2): 761–767. PMID 12981016. ^ US Food and Drug Administration: "Listing of Food Additives Status Part I". Archived from the original on 2012-01-17. Retrieved 2011-10-27. ^ Widengren, J.; Chmyrov, A.; Eggeling, C.; Löfdahl, P.-Å. ; Seidel, C. A. (2007). "Strategies to Improve Photostabilities in Ultrasensitive Fluorescence Spectroscopy". The Journal of Physical Chemistry A. 111 (3): 429–440. doi:10.1021/jp0646325. PMID 17228891. ^ Beynon, C. M.; McVeigh, J.; Chandler, M.; Wareing, M.; Bellis, M. A. (2007). "The Impact of Citrate Introduction at UK Syringe Exchange Programmes: A Retrospective Cohort Study in Cheshire and Merseyside, UK". Harm Reduction Journal. 4 (1): 21. doi:10.1186/1477-7517-4-21. PMC 2245922. PMID 18072971. ^ "The Riordan IVC Protocol for Adjunctive Cancer Care: Intravenous Ascorbate as a Chemotherapeutic and Biological Response Modifying Agent" (PDF). Riordan Clinic Research Institut. February 2013. Retrieved 2 February 2014. ^ "High-Dose Vitamin C (PDQ®): Human/Clinical Studies". National Cancer Institute. Retrieved 2 February 2014. ^ China's grip on key food additive / The Christian Science Monitor. CSMonitor.com (2007-07-20). Retrieved on 2012-12-04. ^ Davies, Michael B.; Austin, John A.; Partridge, David A. (1991). Vitamin C : its chemistry and biochemistry. Cambridge [Cambridgeshire]: Royal Society of Chemistry. ISBN 9780851863337. ^ "A Simple Test for Vitamin C" (PDF). School Science Review. 83 (305): 131. 2002. Archived from the original (PDF) on July 4, 2016. Clayden; Greeves; Warren; Wothers (2001), Organic Chemistry, Oxford University Press, ISBN 0-19-850346-6 . Coultate, T. P., Food: The Chemistry of Its Components (3rd ed. ), Royal Society of Chemistry, ISBN 0-85404-513-9 . Gruenwald, J.; Brendler, T.; Jaenicke, C., eds. (2004), PDR for Herbal Medicines (3rd ed. ), Montvale, New Jersey: Thomson PDR . McMurry, John (2008), Organic Chemistry (7e ed. ), Thomson Learning, ISBN 978-0-495-11628-8 . 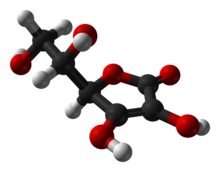 Wikimedia Commons has media related to Chemistry of ascorbic acid. This page was last edited on 20 April 2019, at 17:00 (UTC).